10. Damage by Aphids. The Responses of Plants to the Feeding of Aphidoidea: Principles. The Responses of Plants to the Feeding of Aphidoidea: Specific Responses and Damage (P.W. Miles). Crop Loss Assessment (P.W. Wellings et al.). 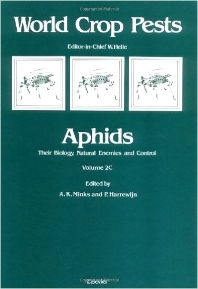 Viruses Transmitted by Aphids (E.S. Sylvester). 11. Control of Aphids. Chemical Control: Introduction. Chemical Control to Reduce Damage. Chemical Control to Reduce Virus Diseases (A. Schepers). Aphid Resistance to Insecticides (A.L. Devonshire, A.D. Rice). Biological Control: Introduction (M. Carver). Biological Control in the Open Field (R.D. Hughes). Biological Control in Greenhouses (P.M.J. Ramakers). Modifying Aphid Behaviour (R.W. Gibson, A.D. Rice). Host Plant Resistance (J.L. Auclair). Integrated Control (P. Harrewijn et al. ).